This is the sixth part in my Breaking Down the Blues series. It’s a follow up to my last post, Breaking Down the Blues, pt 5: The Major Pentatonic Scale. I’ll be referencing that article a lot, as well as ideas from part 1. In this post, I’m going to demonstrate a blues solo that uses the major blues scale and the minor blues scale. 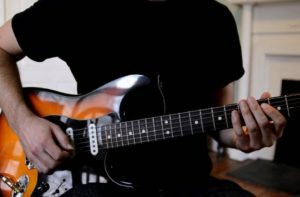 I’ll show how you can switch between these two scales when playing a blues solo, and hopefully you’ll pick up some cool licks along the way too. The solo is played over a blues progression in the key of A. I made the solo with a lower intermediate student in mind. Overall, I tried to keep the solo relatively simple, although there are a couple faster runs mixed in. Note that the ‘Albert King Box’ portion of both scales is circled in red. I’ll be referencing that part of the scale later. Here is a video recording of the solo, in full. Along the bottom of the screen, I’ve noted which phrase I’m playing, and which scale (major or minor) it’s coming from. Now, let’s start breaking down the individual phrases in the solo. 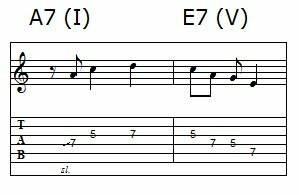 Phrase 1 covers most of the first 4 bars of the blues progression, which are over the A7 or I chord. The whole phrase uses the major blues scale in the ‘box pattern’ area of the scale in the 2nd to 5th frets. I think that the best place to use the major blues scale is over the I chord. Since this is the opening phrase of the solo, I chose to leave some open space (without any notes happening) here and there, and kept the ideas fairly simple. Phrase 2 covers the end of bar 4, plus bars 5 and 6. In bar 4, I’m still playing over the I chord. Bars 5 and 6 are played over the IV chord, or D7. I find that that major blues scale doesn’t sound as good over the IV chord, so I switched to the minor blues scale for this phrase. It hangs around in the ‘box pattern’ area of the scale, which now spans the 5th to 8th frets. Notice how I’m repeating slightly different versions of the same idea in this phrase (as well as in phrase 1). The use of repetition is key to developing a nice sense of phrasing when building a solo. Phrase 3 is a short phrase that mostly happens in bar 7 of the blues progression. We’re back to the I chord in this bar, so I’ve switched back to the major blues scale. 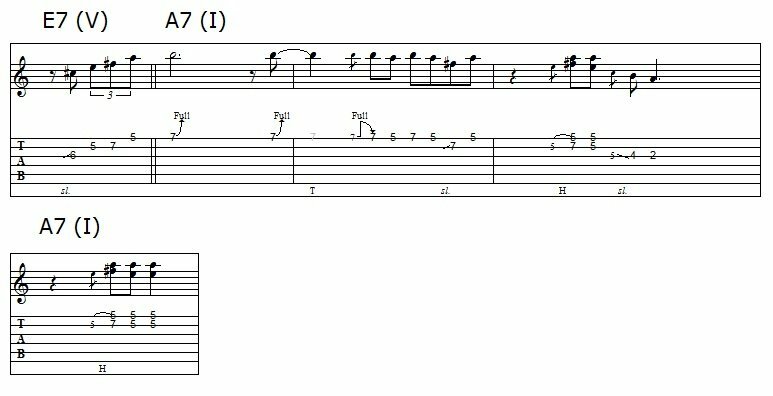 I start off in the ‘Albert King Box’ area of the scale in the 5th and 6th frets, and then make my way down to the ‘box pattern’ area on the 2nd fret. Phrase 4 starts toward the end of the 8th bar of the blues progression, and continues through bars 9 and 10. The 8th bar is still over the I chord, while bars 9 and 10 are over the V (E7) and IV (D7) chords. Until now, the phrases have been coasting along, staying at more or less the same level of intensity. In this phrase, I wanted to take things up a notch and bring a little more tension and excitement into the solo. Regardless of which approach you take when raising the intensity, you want to make sure that it contrasts with whatever came right before it. So, back to the phrase at hand. I decided to go with playing a fast run of notes, while also slipping in a number of bends. Also, the notes in this phrase are a little higher than the ones that came before. 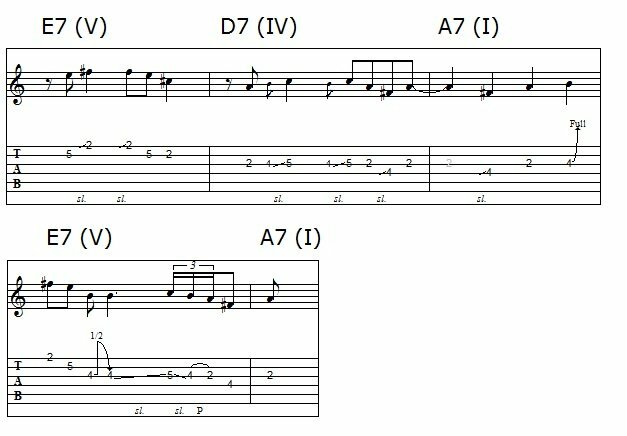 All the notes are pulled from the box pattern of the minor blues scale. I make use of some common, cliche blues licks, and make an extended run of triplets (playing 3 notes per beat). Until now, I’ve had some short bursts of triplets, but this is the longest run of that type of note yet in the solo. 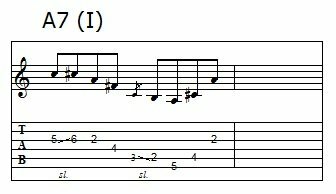 Overall, this lick provides a burst of energy that will nicely set up the beginning of the next chorus, or round of the 12 bar blues progression. Phrase 5 is a short, simple phrase that wraps up the first chorus of the solo. It takes place over the 11th and 12th bars of the progression, which are over the I and V chords. It uses the box pattern of the minor pentatonic scale. This phrase is meant to draw the excitement down a bit from the previous phrase, in preparation for the next phrase that will be kicking off the 2nd chorus. It also targets the root note of the V chord, which brings a conclusive sound to the solo before starting the next chorus. Phrase 6 is the first phrase in the second chorus of the solo. Since a new chorus is starting, I wanted to start off by bringing the excitement up a little. The phrase starts off in the later part of the 12th bar of the 1st chorus (over the V chord, E7), and continues through the first 4 bars of the second chorus, which are over A7/I. It uses the Albert King box area of the major blues scale. I start off by doing a couple of full bends (bends that push the note a whole step/2 frets away). Like I said before, bends can be a nice way of introducing some new intensity into a solo. This is especially true if they are in a higher register than you’ve previously been in the solo, which these are. After the bends, I play a couple double stop licks (licks involving more than one string at a time). Phrase 7 is played over the end of bar 4 (A7/I) as well as bars 5 and 6 (D7/IV) of the second chorus. It uses the minor pentatonic scale in the Albert King box area as well as the box pattern area. This phrase marks a slight increase in intensity from the previous phrase by making use of some long, higher bends. I intentionally made it sound similar to the beginning of phrase 6, which brings a sense of phrase to phrase unity and developing a melodic idea. These are both important concepts when putting together a solo in any style. Phrase 8 comes off of the intensity of phrase 7, and tries to keep that energy about equal. Overall, phrases 7 and 8 represent the climax of the solo. Phrase 8 takes place over bars 7 and 8 (both on A7/I) of the second chorus. It uses the Albert King box of the major blues scale. To my ears, it keeps the energy more or less equal to that of phrase 7. It does this by dropping to a slightly lower register, but at the same time being more notey and fast. Note that it uses a trill in one spot (marked by a tr in the tab), which is a fast succession of hammer-ons and pull-offs. Phrase 9 brings the energy back down, preparing for the end of the solo. It takes place over bars 9 (E7/V), 10 (D7/IV), 11 (A7/I), and 12 (E7/I) of the second chorus, which are the last 4 bars of the solo. It uses the box pattern of the major blues scale. Overall, this phrase’s purpose is to slow things back down and bring the solo to a close. I bring the dynamic down from the previous phrase by dropping to a lower register, and being a bit more sparing in the number and rate of the notes that I play. Posted in The Blues and tagged Blues, Improvisation, Lead Guitar, Scales.